The news that Olli Maatta will be week-to-week with a lower body injury leaves a hole in the Penguins' lineup, but someone will be left out with 7 active defensemen on the roster and 6 available spots. And when looking at the players available and their performance this season, it's clear who should be the odd man out. Ben Lovejoy wasn't the answer for this team last season when he was acquired from Anaheim at the trade deadline, and Lovejoy isn't the answer for the team this season. When filling out his lineup, Mike Sullivan should just say no to playing Ben Lovejoy. The Penguins know what they have in Lovejoy, and it's nothing special. He's a mediocre defenseman that shouldn't be any higher than the third pairing on a contending team, if he's in the lineup at all. And given the way Mike Sullivan has the team playing, he shouldn't be in the Penguins lineup with or without Olli Maatta. Pensburgh had a good writeup yesterday on the changing of the guard on the Pens' blueline, and how the team has transitioned to an offensive minded group of defensemen under Sullivan. Notice that when listing the offensive talents on the team and their production in 2016, six Penguins defensemen make the cut . Justin Schultz's small sample size doesn't make the list, though the 1.2 points per 60 in Pittsburgh would place him in the same tier as Ian Cole, Trevor Daley, and Derrick Pouliot. Ben Lovejoy's 0.6 pts/60 falls short and sets him apart from his teammates. The Penguins' identity under Sullivan, what has pushed them to playing like one of the best teams in the league, has been their skating and ability to push the play to the offensive zone. They've retooled their defense to include mobile blueliners who can move the puck. They've acquired both Daley and Schultz because their offensive talents and puck skills mesh perfectly with that vision, regardless of the concerns over their defensive play. And the less a team plays in the defensive zone, the less that matters. And Pittsburgh has been an elite possession team under Mike Sullivan. They're 2nd in the league since he took over with a score-adjusted 55.4 CF%, and they're peaking at the right time heading into the playoffs with a 57.4 SACF% since the trade deadline. With Maatta out, they need to plug someone in who fits that identity, and can help continue the strong play the Penguins have had. 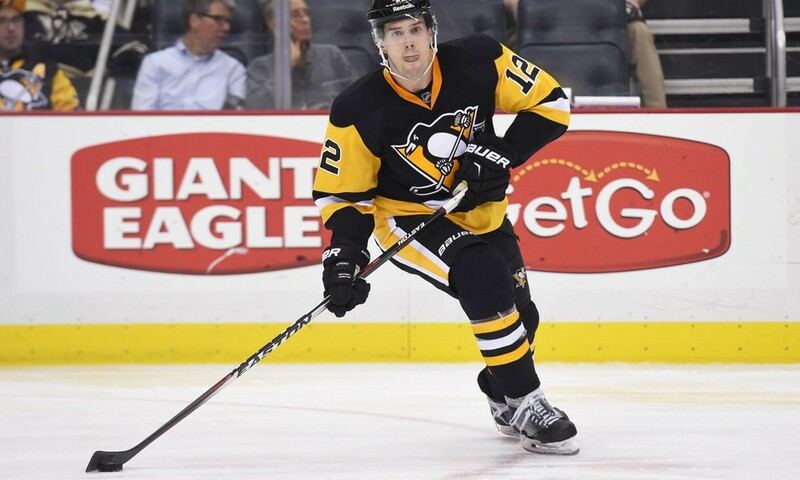 That's not a great fit for Lovejoy, but Derrick Pouliot fits that role perfectly. The former 8th overall pick in 2012 has all the tools that Mike Sullivan is looking for on the blueline - mobility, vision, puck skills - and he's been a great driver of possession this season with a 59.4 SACF%. The Penguins get 64.1% of the scoring chances when he's on the ice, and they've posted a 60.0 GF% too. These numbers are all solid increases over what his teammates have done with him on the bench. There are some of the usual concerns over a young player, particularly a young defenseman, like consistency and work ethic, but they're misguided. Sure, Pouliot might have a lapse that leads to a great chance for the opposition that a more experienced defenseman might not have made, but in context it's likely after creating several great chances for Pittsburgh that a typical veteran wouldn't be capable of pulling off. Based on the pairings at yesterday's practice, it looks like the Pens are going to try reuniting the Lovejoy-Dumoulin pairing, but it would be a mistake to use one of their better defenseman to try and prop up Lovejoy. On the season, Lovejoy and Dumoulin have a 53.6 CF% when on the ice together. While Dumoulin maintains a 52.5 CF% without him, Lovejoy drops to a 47.4 CF% away from Dumoulin. The pairing has a 56.8 GF% while together, but Dumoulin jumps to a 58.5 GF% on his own while Lovejoy falls to a 52.6 GF%. Based on the splits, it would seem to be clear which defenseman is really benefiting from that pairing. The Penguins have built their identity on speed and possession under Mike Sullivan, and it's helped to put them in the position they're in today after an uninspired start to the year under Mike Johnston. With Olli Maatta possibly being out of the lineup into the postseason, it's important that they play someone who can help play to these strengths and use the remaining nine games to get primed for a playoff run. Ben Lovejoy might be the "safe" pick, but for little risk comes very little reward; there's no reason to believe Lovejoy will be an asset to this team on the ice. Pouliot might be viewed as more of a risk, but there's no question that he has a much, much higher ceiling. There's a decision that needs to be made in Maatta's absence, and there's one thing that Mike Sullivan needs to do - say no to Ben Lovejoy.